Dating an older man has its perks. But unless the said older man is in his eighties, there's a chance that even he comes with mother-in-law. The diet of mine seemed to consist mostly of Silk Cuts, but in an attempt to win her over I decided to have her over for dinner. I cooked for hours and in the process chopped off my fingertips (accidentally, mind you - I'm not a serial killer on the run from FBI, desperately trying to get rid of my fingerprints!) But with Scandinavian stoicism (and a plastic bag wrapped around my bleeding hand) I soldiered on and managed to get the food on the table. And what did she do? She brought her own food. In a zip lock bag. Didn't want to "be any trouble", you see. Since then she (too) has dared to try my cooking. And actually liked some of it. 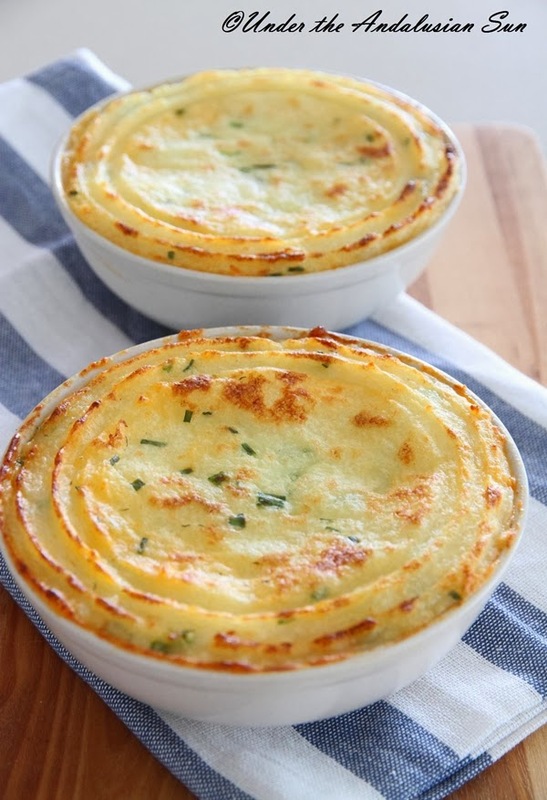 Such as this British classic: fish pie. If you want, you can substitute orange zest with lemon zest but I find orange gives fish dishes a lovely warmth. If you prefer a fishier taste, instead of milk you could make the sauce with shell fish stock, in case you've been busy making some. Boil or steam the potatos. Mash with butter adding milk (if needed) for right consistency.Add chives and season. Let cool until ready to bake. Finely chop the onion and sauté in butter until soft. Then add flour and keep stirring for a couple of minutes. Then add (hot) milk and stir until smooth. Keep cooking over moderate heat for about 10 minutes. Then add lobster find, orange zest, tomato concentrate, chilli and cream. Check the taste and season as needed. Then add fish and seafood in the order of cooking. First fish, cut into strips of a couple of cm thick, a couple of minutes later king prawns and a couple of minutes after that the squid and the peas. Cook, covered for a little while until everything's done. Divide into bowls and let cool for a bit. Top with strips of cold smoked salmon. Then spread the mash on top (for an even finish, use the back of a spoon dipped in hot milk!). If you want, you can decorate using a fok. If you really want to go to town with it, you can use a piping bag, but in that case you'd better double the quantity of mash. Bake at 200° until the pie starts to colour a bit.